The first New Zealand Championship was held at Bellamy’s in Christchurch from 19th August to 4th September 1879. A brief general historical note is in order here. European settlement in New Zealand commenced only around 1840, the majority of these settlers coming from England, Scotland and Ireland in the early decades. The new country achieved effective self government in 1856 and the first nineteen(!) prime ministers were, perhaps unsurprisingly, born overseas, mainly in England, Scotland or Ireland. The home countries were among the first to stage national championship tournaments (England 1866, and Scotland the following year) so it is perhaps not surprising that emigrating chess players took this strange new idea with them to the other side of the world. It can be noted that Australia held its first championship at Adelaide in 1887 and players from the two Australasian countries frequently competed in each other’s championships for many years. Competitors living within fifteen miles of Christchurch had to pay a five guinea entry fee for that first championship while others were allowed in free. This was to restrict local entries; in the event five of the eight competitors had coughed up the five guineas and the other three players were from other South Island towns. The rules of play were as in Staunton’s Chess Praxis and the time control was 15 moves per hour. The tournament was a double round-robin, a format never again used for this event, and interesting was the fact that there were no fewer than five arbiters to cope with just the four games. The prize fund was a handsome £80 with £50 for first, £20 for second, and £10 for third prize. The tournament resulted in a tie between Henry Hookham and David Hay which was resolved by a single play-off game, won by the London-born Hookham after six hours play. at Dunedin in January 1890 against another new crop of players. Scotland is about to hold its 112th as I write. England also got into the act very early, with the first British Championship being held in 1866 and three more at two-year intervals, but they seem to have lost the plot after 1872 because the fifth in the series was not held until 1904.
suppose. It wasn’t too long before someone beat Siedeberg’s record of two titles. Richard James Barnes won the 4th championship and won two more in 1896/97 (10th) and 1897/98 (11th). He later won the 15th and 19th championships to finish with five titles. Altogether Barnes played in 28 championships, 22 of them consecutively. As intimated above the New Zealand championship tournaments were normally single round-robins, the number of players usually being in the 11-14 range but the Christchurch Exhibition Year event (1906-07) had twenty players including the young Australian duo of William S.Viner (25) who won first prize with 17½/19 and Spencer Crakanthorp (21) who finished second on 15 points. Third was Arthur Davies who won the second of his four titles the following year (Easter 1908). Fedor Kelling followed in 1908/09 and John Mason, who had twice tied for first place but lost playoffs, finally won the title in 1909/10. Namesake William Mason, who had already won two titles, took the next two championships, giving him four titles. He won another in 1913/14 and then Kelling gained his second title with the fine score of 11½/12 in 1914/15. Kelling was to play in many more championships (36 in total, 29 of them consecutively) but is probably better remembered for his administrative roles – as a New Zealand Chess Association councillor/secretary and also a publicist. Indeed his very variable results could to some extent be blamed on his regular reporting duties. There now followed a break of four years before service resumed with the 29th championship in 1919/20, won by William Mason for a record sixth title. Mason played the following year and then retired from tournament play while in his mid-40’s; he died in 1960. John Dunlop registered the first three-peat in the 30th-32nd championships, two of them after single-game play-offs, and then followed three Australian victories to Spencer Crakanthorp, Cecil Purdy, and Crakanthorp again. These three events used the Holland system with two preliminary groups comprising up to 20 players. The exact format varied but always the players from the same preliminary group carried forward their mutual results to the final. Arthur Davies won the 36th championship (another Holland system) and defeated Kelling in a play-off in the 37th (1927/28). Davies’ death only a week or so later marked the end of an era in a way. The two Mason’s had retired, Barnes last played in 1926 and died in 1929, and Kelling was not to win again. John Erskine scored 8/8 in 1928/29, the second 100% result after Robert Cleland’s 4/4 in 1898. Then the Australians rediscovered New Zealand with Gunnar Gundersen winning the 39th and 41st championships (Alfred Gyles won the one in between after a play-off versus Erskine) and AngloAustralian Maurice Goldstein the 42nd in 1932/33. Dunlop returned to the fray in 1933/34 after a seven-year absence, defeating Gyles in a play-off while Erskine won his second title in 1934/35. Gyles was second again in 1935/36 but this time it was enough. “Hard-luck” Gyles, as he was known had previously finished second no fewer than ten times, including four lost play-offs. But the eligibility rules had been changed in 1934 to debar foreigners from winning the national title and the winner in this 45th championship tournament was the Australian, Cecil Purdy. The next two champions were one-time winners – Hedley Abbott (1936/37) and Sin Hindin (1937/38). Hindin was a school friend of Aron Nimzovitch who became a naturalised Englishman before emigrating to New Zealand in 1930. Dunlop brought his title tally to six, equalling W.E.Mason’s record, with victories in 1938/39 and 1939/40. Travel restrictions imposed by the government during the war restricted the field to just nine players in 1940/41 where 14 was typical over the previous ten years. There was a tie between a couple of newcomers, Bob Wade and Philipp Allerhand, a Viennese doctor who had settled in New Zealand shortly before the war (smart move!). Wade, then 19, was playing in his second championship but lost the play-off. The travel restrictions mentioned above caused the cancellation of the next two congresses so the 51st championship was played in 1943/44 when Wade tied for first place again, with Edward Severne. Thus time Wade won the play-off, 2-0. Severne played in 27 championships and, like Davies and Dunlop, went out on a high note – this was his best result. He never won the championship but was placed second equal with Purdy behind Gundersen in 1929/30 – a few years later that would have given him the title. Severne died in 1955 aged 77. Wade won again in 1944/45 with Tom Lepviikman taking second place. The latter was born in Estonia in 1900 and arrived in New Zealand in 1939 after living in the Netherlands for many years. Lepviikman won the 53rd championship (the Victory Congress, 1945/46) with Wade and J. David Steele sharing second. Lepviikman won the second of his two titles in 1946/47 with Steele second again. Steele was about 3 years younger than Wade but never played again after this. Wade won his third title in 1947/48 in what was to be his last before he left for Britain where he has since won a couple more national titles. The next three congresses comprise a sort of interregnum – between the departure of Wade and the arrival of Sarapu. They were won by Alan Nield who was born in London, lived for some years in Australia before coming to New Zealand, from which he later returned to England; Allerhand, returning for a second title after a nine year absence from the championship; and David Lynch, whose victory in 1950/51 followed two second places. Ortvin Sarapu, the man who became known in New Zealand as “Mr Chess,” was born in Estonia in 1924 and won that country’s junior championship in 1940. Later he played in a number of tournaments in northern Europe including that at Oldenburg in mid-1949 where he met (and played) Bob Wade who put in a good word or two for New Zealand. Sarapu arrived in New Zealand late in 1949, at a time when it is probably true to say that the country’s chess was in a poorer state than usual owing to deaths, retirements and, in Wade’s case, emigration. Certainly Ortvin made short work of his first four sets of opponents on the way to a new record of four consecutive victories. For some years now the championship field had been 12 players and three of those victories were gained with 10½ points from his 11 games and a three-point margin from second place. Sarapu scored only 8 points in 1952/53 but that was with a 10-player field! The next four championships were Sarapu-less (he won the Australian Championship in 1956/57 and was fourth in 1958/59). This was a period when a number of talented young players started coming through. Fred Foulds won in 1955/56 while Arcadios Feneridis and Rodney Phillips shared first place in 1956/57. There were two points of interest in the latter result. Play-offs had always been held to resolve first-place ties but in this case the play-off proved difficult to arrange and the two winners were later declared joint champions. Subsequently, playoffs were abolished altogether, allowing for joint tenure of the title. The second point was that Phillips, at 14½ years, was (and remains) the youngest New Zealand champion. Phillips won by himself in 1957/58 and Foulds won his second title the following year in a tie with Barry Menzies. Foulds retired from tournament play after this, having won two of the four championships he contested. Sarapu won the next two championships to equal the record of six titles but was thwarted in his attempt to break the record in 1961/62 when Graham Haase scored an upset victory, leaving the country’s “big three” of Sarapu, Phillips and Feneridis sharing second place a half-point off the pace. Sarapu then took the record by sharing the title with another young player in Richard Sutton (1962/63) while Roger Court became the second player to head Sarapu when he won the 71st championship in 1963/64. Phillips won in 1964/65 with Sarapu and Sutton equal second and then it was Sarapu in for title number 8 in 1965/66. Sadly, that year turned out to be the last time that Roger Court and Rodney Phillips played in the championship. Court died in 1967 in his mid-thirties while Phillips, who had spent some time overseas, died tragically in Wellington in 1969 at the age of 26. The Canterbury Chess Club celebrated its centennial with the 1966/67 Congress and a 14-round Swiss system Championship tournament which attracted a number of players from overseas. It has always surprised me that the New Zealand contingent was so weak – no Phillips, no Sutton, no Feneridis, no Court. Yuri Averbakh won with 13/14 followed by Rodolfo Tan Cardoso (Philippines) 11½, Paul Dozsa (Australia) 11, and Sarapu 10½. Then followed four more Australians! Bruce Anderson, who debuted the previous year in Christchurch at the age of 18, won in Sarapu’s absence in 1967/68 and then proved his worthiness to that title by sharing it with Sarapu the following year. It was Sarapu again in 1969/70 (title number 11) with the newly arrived Dr. William Fairhurst sharing second place. Fairhurst, born in England but many times champion of Scotland, played in three more New Zealand championships over the next six years, always finishing in the top four. He died in Auckland in March 1982. Sutton annexed two more titles in 1970/71 and 1971/72 with Paul Garbett (who debuted in 1970/71) runner-up on both occasions. Sarapu, back from a two-year break, won the next two championships, sharing the second of these with Garbett who won outright in 1974/75 when the format was an ungainly 16-player 11-round Swiss. playing in his second championship, lost in the final round to Fairhurst thus allowing Sarapu and another first-timer, Lev Aptekar (ex-USSR), to catch up. Chandler has only played three times in the New Zealand championship because of his settling in England around 1980.
in 1983/84 and Small his fourth in 1984/85. Sarapu, now into his sixties, shared the title with Adrian Lloyd in the 24-player Swiss of 1985/86 but then it was back to the 12-player round-robin format again for Russell Dive (20) to win his first title in 1986/87 andJonathan Sarfati (23) his only title a year later. Anthony Ker (21) won his first title, shared with Garbett, in 1988/89 after four not particularly impressive efforts previously. Sarapu won his last title at the age of 65 in a tie with Ben Martin in 1989/90. He played twice more in the championship, for a total of 31 championships (only five fewer than Fedor Kelling) and a remarkable 20 titles. The next five years belonged to Ker who won three titles outright and one tied (1993/94, with Peter McKenzie). 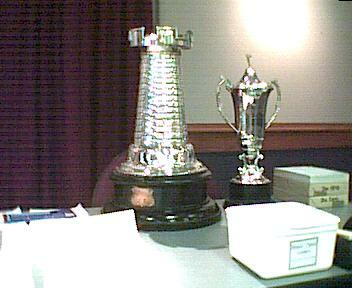 This included three in a row, starting in 1992/93 – the 100th New Zealand championship tournament. The one that got away was 1991/92 when Martin Dreyer gained his first title. Another triple tie followed Ker’s winning sequence with Dreyer, Dive and Robert Smith sharing the title in 1995/96. The Swiss became the tournament format of choice from 1996/97 when the event was won by Australian GM Ian Rogers. Russian émigré Alexei Kulashko was runner-up, thereby winning his first New Zealand title. He won again the following year before Dive gained his third title in 1998/99 with a hugely dominating 10½/11. Ian Rogers made the same score in 1999/2000 with GM Drazen Sermek (Slovenia) and Kulashko sharing second; title number three for Alexei. Then Chris Depasquale (Australia) won in 2000/01, the title going to second placed Scott Wastney. Then, starting in 2001/02, Anthony Ker made a little comeback. He was never far off the pace during his six title-less years but has now won four unshared titles in a row, making a total of nine titles. Australian IM Alex Wohl actually took first place in 2005 and also, in a tie with fellow countryman Tim Reilly, in 2003. Thus Ker equalled Sarapu’s fifty-year old record of four consecutive titles and has the chance to break it next January. It won’t be easy, Anthony! Some brief statistics follow. Two players played in more than 30 championships: Fedor Kelling, 36 (of which 29 were consecutive) between 1902 and 1946, and Ortvin Sarapu, 31 between 1951 and 1997. Richard Barnes played 28, Paul Garbett and Eddie Severne 27. Sarapu won no fewer than 20 titles and would doubtless have won a few more if he hadn’t played in several Australian championships which are held concurrently. Anthony Ker has nine titles, gathered over a relatively short period of 16 years, and next are John Dunlop and William Mason with six. The youngest champion was Rodney Phillips who was 14 when he shared the title with Arcadios Feneridis in 1956/57.